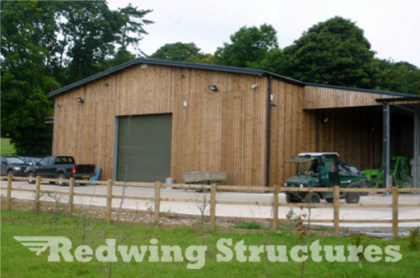 The Culden Faw Estate remit to Redwing Structures was to create a general purpose agricultural building which could be adapted as the estate evolved. To date the building houses numerous divisions of the estate ranging from forestry to the famous Pheasant Shoot. The wings of the building, cantilevered from the main span provide excellent cover for machinery, shoot wagons etc. The most recent addition is the inclusion of a purpose built Game Larder to house the ever increasing supply of Hambleden Wild Game.